I made a short experiment, check a graph below. I have checked the last 200 sold domains on Flippa, independently who were selling it and how the auction was promoted. 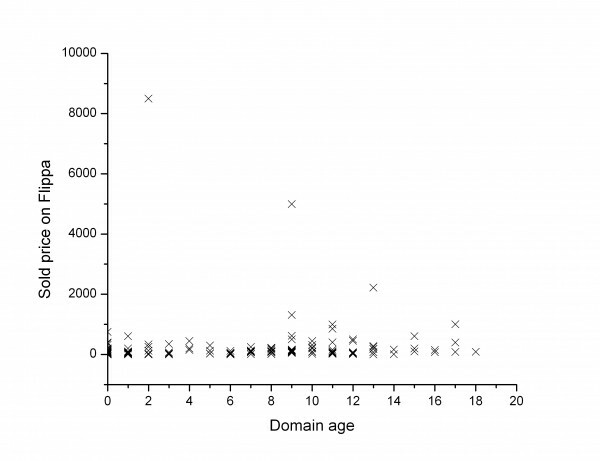 I wanted to know that domain age as a single parameter does any predictive value on an auction outcome. Checking the plot, one can confidently say it doesn’t, which is somewhat surprising. I have to admit that when I value a domain, age is the first thing that I am interested in. Maybe I have to change my habits. And what are those outlying data points with high price mark? The two years old gift.info was sold for $8500 via Buy it now. Sounds extremely overpriced, it was sold for $1500 by a very experienced domain broker a year ago, so one thought that it was the maximum price the domain will ever reach. Especially because having the .gift extension, gift sellers really have a domain pool to choose from. The runner-up is cyclr.com with its $5000 sale price, which is a 9 year old domain. The price is really irrationally high again but at least there is a website running already there so a developer was immediately looking for a domain name for a finished project and chosen this domain name. Coinfund.com is the third, which was sold for $2222. Another one where one can ask why? The buyer should really like number 2 that seems to be the only rational reason. The oldest domain in this list was notebooksales.com from 1997 where the winning bid was a disappointing $87. The listing had no description though. What is the conlusion? Flippa buyers buy what they like for a price they like. These outcomes were really unpredictable, so it looks like good marketing is much more important than being old. Of course I would not conclude that age is not important, so why is it not apparent from the results? Most probably because good aged domains are the most expensive ones and they are unsold in most of the times, so simply these domains are not plotted. I have to redesign my experiment to make age factor visible. 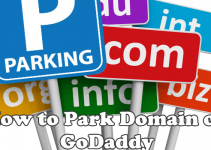 How to find brandable domain names easily?